I shove Stieg Larsson’s book back on the shelf. I’m not really in the mood for such a dark read. That means Connie Willis and her Doomsday Book is out, too. Indecision wraps around me and the first touch of panic grips me. I start scanning the titles faster and faster, whispering to myself, ‘No . . . no, not that one . . . too dark . . . too Swedish (it really is taxing to read in another language) . . . too light-hearted . . . too philosophical . . . ‘ and my internal, sometimes external and very audible, commentary continues. I’ve got two weeks left! In a couple of weeks, I’ll be dropping the kids off to school every morning and once again tackling my own writing. Since I tend to read more complex books while I’m writing, books that can take anywhere from a week or more to finish, I need to take advantage of every moment I can. For the next fourteen days, if I’m not at the park, fixing meals, cleaning up after meals, refereeing disputes, doing the laundry, cleaning the house, begging God to have mercy on us and send a cold front through Stockholm, diffusing tantrums, or any other typical mom duty, I want to be reading! On those rare occasions when both of my children discover they actually can play together without trying to kill each other, as Pokémon battles erupt all around me and roars of superheroes saving the world fade into the background, I want to curl up in a safe place and get lost in a good book. The million-dollar question is: which one? As some of you may know, I’m a book juggler. It’s not like I meant for it to happen, but since becoming a mom, I’m a bit scatterbrained. I don’t have time to scramble around looking for that one book I was reading. What started out as a simple solution, make sure I have a book to read because I never know anymore when I’ll get five minutes to myself (and some days, yes, escaping into another reality is more important than a shower), has turned into a way of life. At any given time, I’ve started one on the iPad, one on the phone, and a paperback or hardcover thrown in for good measure. I wrote that confession almost two months ago and I’m happy to report that I’ve cut down the number of books I read simultaneously at one time. Don’t go into shock, I’m not completely cured of my juggling condition, but I am limiting myself to two–one digital book, and one tangible book. Yesterday, I finally finished an epic fantasy book on my phone that frankly left me disappointed–and wanting more. That means, today I get to choose a new book! How exciting! I’ve got about thirty books to choose from that I’ve already purchased (or were donated by a fantastic friend), but that excitement quickly turned to anxiety. Deciding what book to read next is never an easy task for me. 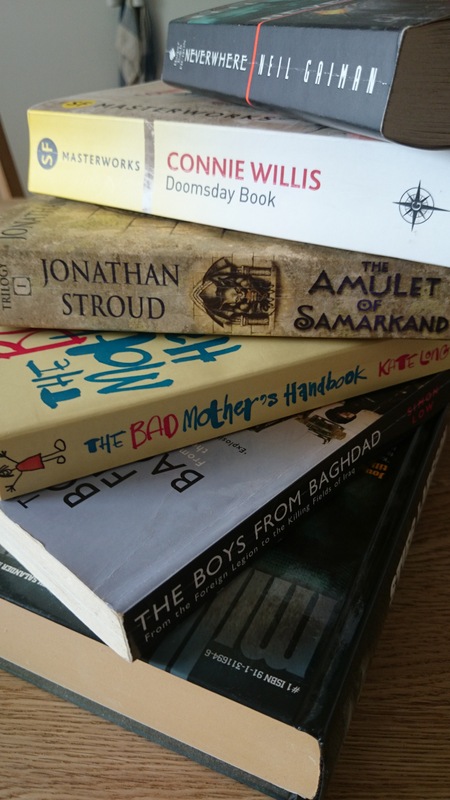 Over at It’s All About Books, blogger Yvo has a TBR jar. I love the idea, but end up excusing away why it wouldn’t work for me (see paragraph of considerations above). Am I the only one who has a difficult time choosing the next book? How do you decide? Please, for the sake of my sanity, share your tips! Previous Article Are Books Dying? With me, it always depends on the mood I am in.